Kathleen Boundy, Esq., is Co-Director of the Center for Law and Education (CLE) and has an extensive background in education law. An attorney with CLE for more than 30 years, Ms. Boundy has played a significant role through legislation, policy development and litigation in implementing and enforcing the rights of students with disabilities, including improved educational outcomes under the Individuals with Disabilities Education Act, as amended, and Section 504 of the Rehabilitation Act of 1973 and No Child Left Behind. Webinar Archive MP3: This is the MP3 Audio file of the Webinar. You can listen using free software such as Windows Media Player or RealPlayer, and download to your IPod and Smart Phone. The following articles appeared in the Fall 2008 issue of Perspectives on Language and Literacy, the journal of the International Dyslexia Association. 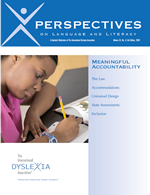 The issue examined the meaningful accountability for students with dyslexia in the context of federal education laws—both the No Child Left Behind Act (NCLB) and the Individuals with Disabilities Education Act (IDEA 2004). The issue was developed by guest theme co-editors Candace Cortiella, Director at The Advocacy Institute, and Rachel Quenemoen, Senior Research Fellow and national technical assistance team leader at the National Center on Educational Outcomes. An overview of the issue is available here. invited presenters at the forum. Video of the forum is available here. * PLEASE NOTE: These materials are for the exclusive use of purchasers of Advocate Academy Webinar live events and archives. Please do not distribute or provide others with access to these materials. Thank you.